Halloween is absolutely, hands down one of my favorite "holidays". Not because it has anything to do with the darker side (I'm not like that, though I do LOVE candy), but mainly because I really love being creative with costumes. I usually ponder endless ideas all year long and then pull it all together last minute. Last year my daughters wanted to dress up Ella - as a Pink Lady from Grease and Rose - a Flower (for obvious reasons). Ella's costume was a store bought costume, we just added some ballet flats, makeup and curled her hair up "Sandy" style. Rose's costume was something I threw together. I bought (at Walmart) a green shirt and skirt, she had the brown tights in her closet already. From the fabric dept at Walmart I found 2 pieces of self-sticking felt which I cut in the shape of a leaf and stuck to the arm of the shirt. I drew the lines of the leaf on with a chalk pencil. A lot of these things I had around the house already - the bee you see on her neckline were actually part of an old bee headband that I tore apart, the other bee we added to the ponytail in back. The petals around her head were created with a small amount of pink tulle in which I embellished with rhinestones I had laying around from other various projects. I actually sewed the tulle with yarn onto a headband (the girls have tons of these they don't wear). Pretty easy stuff! I really don't like throwing things away, especially craft scraps. I seem to always come up with a use for them. Be creative! This year, I scoured the web looking for cute costumes that match our shoes. And you could always take the ideas for these costumes and make your own. Black turtlenecks and leggings or sweatpants will do wonders (think: add red felt polka dots and done, you're little ones a ladybug). You really don't have to spend a lot of moola to get a cute and re-usable result. Pair this little monkey costume, from www.PinkTaffyDesigns.com with our Silly Monkeys Tennis shoes or Mary Janes! 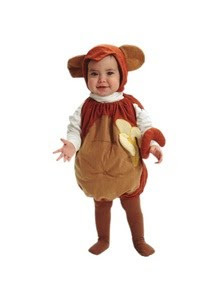 Another inexpensive way to create this costume would be brown pants and shirt, monkey ears headband and monkey tail pinned to the pants in the back. Finalize the outfit with a plastic banana. Easy! Another adorable yet simple option is a bee, which is charming on any boy or a girl. 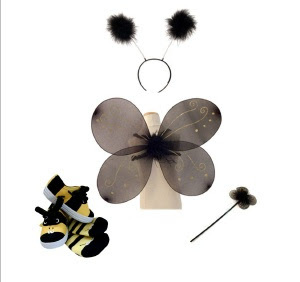 At Monkey-Toes we have all of our bee wings, wands and antenna on sale! Just add a black shirt and pants and voila, instant costume... Plus kids love to play dress up year round, so you'll have this one around after Halloween too! Let me know what you think and if you have any others - there are tons of you crafty ladies out there! Maybe I'll post them too.